Model M65 is a portable sturdy and durable heavy gauge wire 20 pocket magazine display stand perfect for trade shows, warehouses, showrooms, classrooms or any other high-traffic areas. Put your magazines in this rack for maximum viewing. The Big Maggie 20 Pocket wire magazine rack has always been a news dealers delight. This display will enhance your 8 1/2" x 11" magazines, literature or comic books with two side by side rows of 10 pockets to hold them in a neat and orderly fashion. 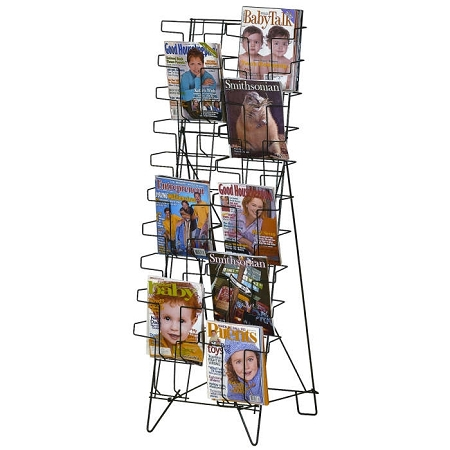 A rugged Magazine Display Rack . The sturdy construction of Model M65 wire magazine rack was made for rough handling. 54"H x 20"W x 23" deep. Bought this baby for my magazines and it's just what I needed. I've since bought 3 more. Perfect for all my shows.